This post is sponsored by iHerb! Thanks so much for supporting these blog posts that keep Healthy Liv up and running. 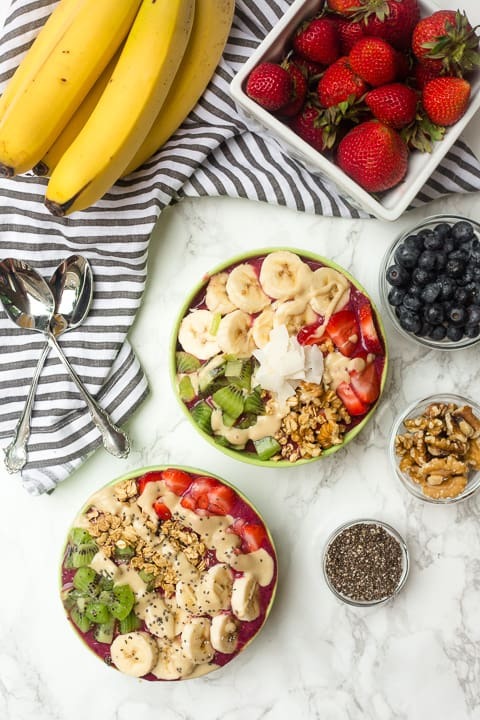 You may’ve heard of acai bowls, which are basically thick acai smoothies served in a bowl with lots of toppings. Acai is a sweet, tropical berry that’s basically a super fruit with lots of antioxidants! It’s pronounced ah-sigh-ee. To make your own acai bowl, you can buy frozen acai packets at most grocery stores or use acai powder. But there are also a bunch of other super fruits you can use for a smoothie bowl. For these, I used maqui powder, which is similar, although less well-known, and it has even more antioxidants. It’s actually the highest antioxidant fruit in the world! And it has a great berry taste. 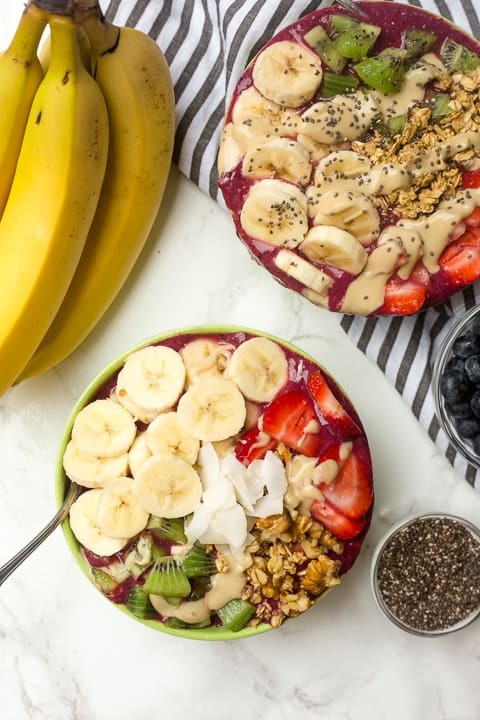 There’s a place in Chapel Hill where everyone loved to get acai smoothie bowls in college (although it was pretty pricey for what you get!). I thought it was good, but after I tried one there, I knew I wanted to make my own at home. And, as a note, you absolutely don’t have to buy maqui or acai or anything to make a delicious smoothie bowl. They just add that fancy smoothie shop touch, and they’re a great source of antioxidants. However, you can get lots of great vitamins and minerals from using just everyday grocery store fruits like bananas, berries, and cherries. 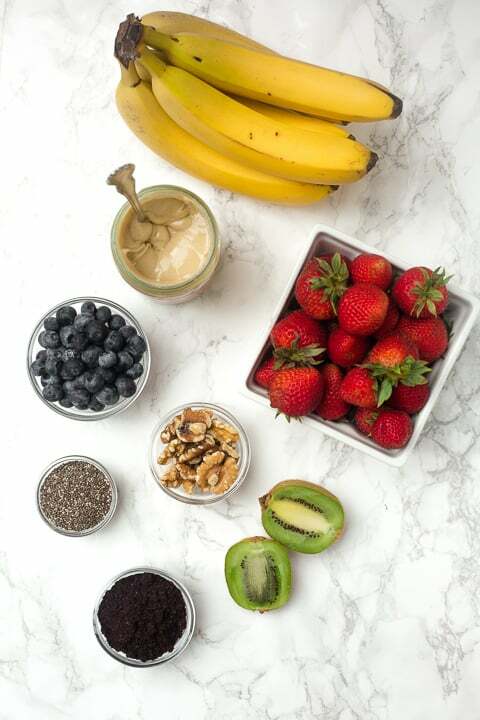 No matter what types of super fruit you add or don’t add, the steps for making an ultra-thick, creamy smoothie bowl are the same. 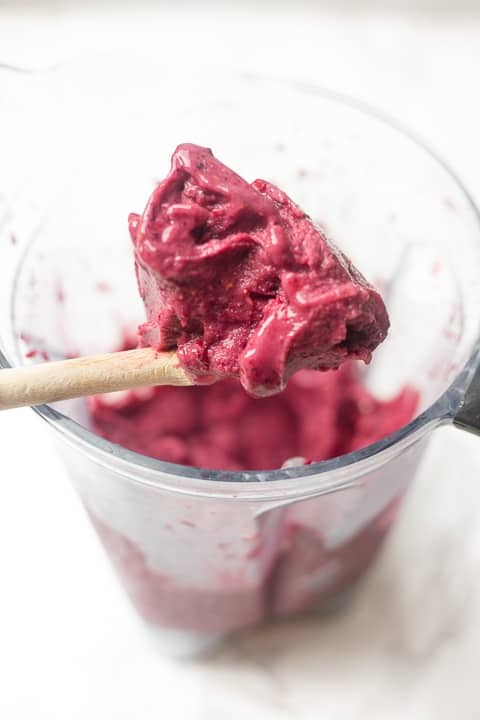 • Start with frozen fruit, and add as little liquid as possible for a thick smoothie. Use a powerful blender. The more powerful the blender, the less liquid you’ll need to add! I use a Vitamix and use the tamper to push the frozen fruit down into the blades without having to add much liquid at all. • Use almond milk, regular milk, or coconut milk rather than water in your smoothie bowl. If desired, place your smoothie bowl back in the freeze for 15-20 minutes before you add toppings and enjoy it. It’ll be even thicker! • Load your bowl with lots of toppings! For a more figure-friendly bowl, start with fresh fruit before adding those yummy, more calorie-dense toppings like nuts, nut butter, and granola. I also love adding a sprinkle of chia seeds! I got all of my maqui smoothie bowl ingredients (other than the fresh and frozen fruit) from iHerb! 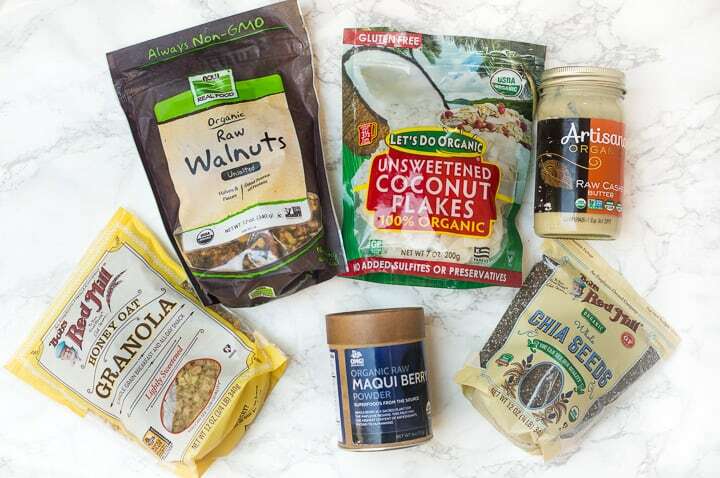 iHerb carries just about every healthy pantry staple you can imagine, from nuts to chia seeds to coconut milk to even vitamins and supplements. The website has over 5,000 grocery products than can be shipped to over 160 countries. It’s a great one-stop shop for things you may not find in your tyipcal grocery store, like maqui powder or cashew butter. I purchased maqui powder, organic chia seeds, organic walnuts, organic cashew butter, organic unsweetened coconut flakes, and granola from iHerb! All customers can get a discount off their iHerb order and new customers can get an additional $5 off their minimum $40 order by clicking here! 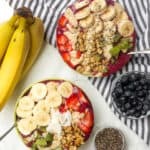 I hope you love this smoothie bowl tutorial! If you make your own smoothie bowl, let me know in a comment or take a photo and tag me @livbane on Instagram! I’d love to see! Add fruit, maqui powder, and chia seeds to blender first. Slowly add just enough milk to blend smoothly. Pour into shallow bowls. Optional: place bowls in freezer for 15-20 minutes to thicken smoothie even more. Top with sliced fruits and then add nuts, unsweetened coconut flakes, granola, chia seeds, hemp seeds, etc. Drizzle about a tablespoon of nut butter onto each bowl. If your nut butter is thick from refrigeration, spoon into another bowl or cup and microwave briefly to melt into a drizzling consistency. Serve immediately. Just tried this and it is great! Definitely a healthy snack or meal alternative! They are expensive to order out…glad to know how to make them at home! Now this recipe sounds yummy, and I think it would be a full lunch. OHHH man this looks amazing Liv. They need to serve this at every local breakfast restaurant! Seeds in my smoothie?!?! Such a simple and great idea thanks.